The What: At this year’s Prolight + Sound Show in Frankfurt, Martin Audio unveiled a new lineup of 10 products across multiple categories including line arrays, stage monitors, and amplifiers. The What Else: The lineup consists of the Wavefront Precision Series of line arrays, the XE and LE series stage monitors, and iKON multichannel amplifiers. 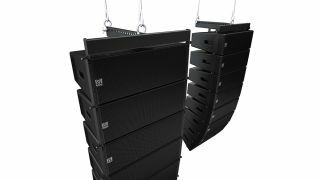 WPC and WPM line arraysThe Wavefront Precision Series is a new generation of multipurpose line arrays designed for a broad range of touring applications, installations, and budgets. Comprising the WPC (two 10-inch LF) and WPM (two 6.5-inch LF), Wavefront Precision line arrays are designed as complete systems with the newly announced external iKON multichannel amplifiers optimized by Martin Audio’s automated DISPLAY software. “Martin Audio’s MLA Series remains the definitive optimized array technology in the market place today, offering customers both the hard avoid feature (the ability to limit coverage in a zone by as much as 30dB) and the patented ability to optimize against multiple target functions—such as frequency response, SPL gradient and leakage, which no other competitive product can,” said Dom Harter, managing director. “But the MLA family consists of fixed resolution systems, and what we wanted to do with Wavefront Precision was to introduce a solution whereby customers could have a flexible and scalable approach to resolution and control of coverage. To accompany the new Wavefront Precision, two new subwoofers, the SX118 and SX218, a single 18-inch and double 18-inch respectively, were also unveiled. iKon amplifiersNext in the roster of new products was the XE Series of high-performance stage monitors. Developed in consultation with leading monitor engineers and combining low-profile enclosures with Coaxial Differential Dispersion technology and a patent-pending third static waveguide, the XE300 (one 12-inch LF) and XE500 (one 15-inch LF) are designed to deliver monitor sound with a defined coverage pattern that allows the artist freedom of movement, while reducing overlap with adjacent monitors. “The world of stage monitoring has been stagnating for far too long with much of today’s monitor technology based on decades old solutions,” said Jason Baird, R&D director. “XE changes the game with the introduction of high-performance Coaxial Differential Dispersion drivers with an additional contour-molded static third waveguide that increases the size of the HF horn mouth to maintain pattern control over a wide frequency band and avoid spill outside the coverage area. Its rolled contour reduces diffraction and further improves pattern consistency at the lower end of the HF passband. The last series to be unveiled was a brand new LE range of stage monitors. Complementing Martin Audio’s high-performance XE Series monitors, the latest LE Series is designed for everyday stage monitoring—delivering performance and controlled coverage at a more accessible price point. Both the LE100 (one 12-inch LF) and the LE200 (one 15-inch LF) are designed for a wide range of users and applications, from up-and-coming bands and regional rental houses, to corporate AV events, HoW, and fixed installations. Instead of the typical “hot spot,” the LE Series produces a near-rectangular coverage pattern over a listening plane at head height, with a wide horizontal coverage close to the monitor that reduces gradually as distance increases to maintain consistent SPL and tonal balance. The Bottom Line: Adopting the principle of scalable resolution, with external, dedicated multichannel amplifiers, Wavefront Precision line arrays are designed to be uniquely flexible, upgradeable, and financially accessible. The XE series is designed as a complete system and is partnered with the new iKON four-channel amplifier, maximizing the capability of the monitor while ensuring both engineer and artist can be confident they will experience the same consistent performance. With compact enclosures and the same Coaxial Differential Dispersion drivers as the CDD-LIVE range, the LE Series monitors deliver cut-through sound with a coverage pattern that allows performers greater freedom of movement compared to conventional monitors.